The University of Manchester (UoM) is a public research university in the city of Manchester, England, formed in 2004 by the merger of the University of Manchester Institute of Science and Technology (established in 1956 as Manchester College of Science and Technology and renamed in 1966) which had its origins in the Mechanics' Institute established in 1824 and the Victoria University of Manchester founded by charter in 1904 after the dissolution of the federal Victoria University (which had members in Leeds and Liverpool), but originating in Owens College, founded in Manchester in 1851. The University of Manchester is regarded as a red brick university, and was a product of the civic university movement of the late-19th century. It was a constituent part of the federal Victoria University between 1880, when it received its royal charter, and 1903–1904, when it was dissolved. The main campus is south of Manchester city centre on Oxford Road. In 2014/15, the university had 38,590 students and 10,400 staff, making it the second largest university in the UK (out of 165 including the Open University), and the largest single-site university. The university had an income of more than £1 billion in 2014–15, of which £262.4 million was from research grants and contracts. It has the third largest endowment of any university in England, after the universities of Cambridge and Oxford. It is a member of the worldwide Universities Research Association, the Russell Group of British research universities and the N8 Group. The University of Manchester is ranked 29th in the world by QS World University Rankings 2016. In the 2015 Academic Ranking of World Universities, Manchester was ranked 35th in the world and 5th in the UK. In an employability ranking published by Emerging in 2015, where CEOs and chairmen were asked to select the top universities they recruited from, Manchester was placed 24th in the world and 5th nationally. The Global Employability University Ranking conducted by THE places Manchester at 27th world-wide and 10th in Europe, ahead of academic powerhouses such as Cornell, UPenn and LSE. It is ranked joint 55th in the world and 8th in the UK in the 2016 Times Higher Education World University Rankings. In the 2014 Research Excellence Framework, Manchester came fifth in terms of research power and seventeenth for grade point average quality when including specialist institutions. More students try to gain entry than to any other university in the country, with more than 55,000 applications for undergraduate courses in 2014 resulting in 6.5 applicants for every available place. According to the 2015 High Fliers Report, Manchester is the most targeted university by the largest number of leading graduate employers in the UK. The University of Manchester traces its roots to the formation of the Mechanics' Institute (later to become UMIST) in 1824, and its heritage is linked to Manchester's pride in being the world's first industrial city. The English chemist John Dalton, together with Manchester businessmen and industrialists, established the Mechanics' Institute to ensure that workers could learn the basic principles of science. Similarly, John Owens, a textile merchant, left a bequest of £96,942 in 1846 (around £5.6 million in 2005 prices) to found a college to educate men on non-sectarian lines. 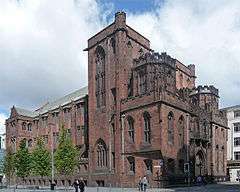 His trustees established Owens College in 1851 in a house on the corner of Quay Street and Byrom Street which had been the home of the philanthropist Richard Cobden, and subsequently housed Manchester County Court. However the largest single donor to Owens College was the celebrated locomotive designer, Charles Beyer. He became a governor of the college and was the largest single donor to the Owens college Extension fund, which raised the money to move to a new site and build the main building now known as the John Owens building. He is also campaigned and helped fund the Engineering chair, the first applied science department in the north of England. He left the equivalent the equivalent of £10 million in his will in 1876, at a time when the college was in great financial difficulty. The Beyer funded the total cost of construction of the Beyer building to house the biology and geology departments Oxford. His will also funded Engineering chairs and the Beyer Professor of Applied mathematics, which still exists today. The University has a rich German heritage. 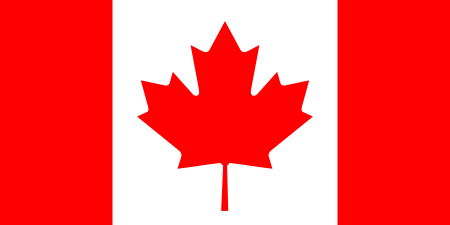 The Owens College Extension Movement based their plans after a large tour of mainly German Universities and polytechnics. The rich Manchester mill owner, Thomas Ashton, was the chairman of the extension Movement and he studied at Heidelberg University. Sir Henry Roscoe studied at Heidelberg too,under Robert Bunsen and collaborated with him for many years on research projects and it was Roscoe that promoted the German style of research led teaching which became the role model for all the modern redbrick universities. Charles Beyer studied at Dresden Academy Polytechnic. There were many Germans on the staff, including Carl Schorlemmer, Britain's first chair in organic chemistry, and Arthur Schuster , professor of Physics. There was even a German chapel on the campus. 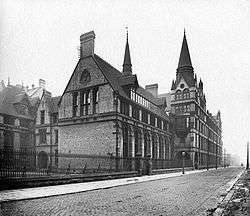 1873 the college moved to new premises on Oxford Road, Chorlton-on-Medlock and from 1880 it was a constituent college of the federal Victoria University. 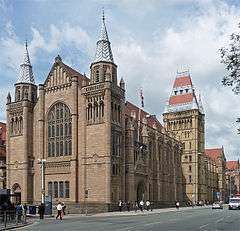 The university was established and granted a Royal Charter in 1880 becoming England's first civic university; it was renamed the Victoria University of Manchester in 1903 and absorbed Owens College the following year. By 1905, the institutions were large and active forces. 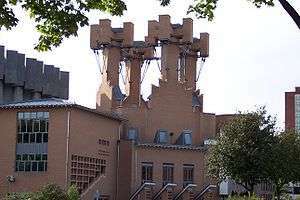 The Municipal College of Technology, forerunner of UMIST, was the Victoria University of Manchester's Faculty of Technology while continuing in parallel as a technical college offering advanced courses of study. Although UMIST achieved independent university status in 1955, the universities continued to work together. 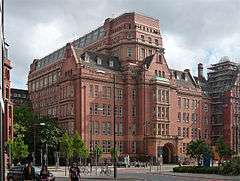 The Victoria University of Manchester and the University of Manchester Institute of Science and Technology agreed to merge into a single institution in March 2003. Before the merger, Victoria University of Manchester and UMIST counted 23 Nobel Prize winners amongst their former staff and students. Manchester has traditionally been strong in the sciences; it is where the nuclear nature of the atom was discovered by Rutherford, and the world's first stored-program computer was built at the university. Famous scientists associated with the university include physicists Osborne Reynolds, Niels Bohr, Ernest Rutherford, James Chadwick, Arthur Schuster, Hans Geiger, Ernest Marsden and Balfour Stewart. 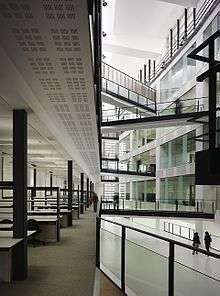 The university has contributed in other fields, such as by the work of mathematicians Paul Erdős, Horace Lamb and Alan Turing; author Anthony Burgess; philosophers Samuel Alexander, Ludwig Wittgenstein and Alasdair MacIntyre; the Pritzker Prize and RIBA Stirling Prize-winning architect Norman Foster and composer Peter Maxwell Davies all attended, or worked in, Manchester. The current University of Manchester was officially launched on 1 October 2004 when Queen Elizabeth handed over its Royal Charter. The university was named the Sunday Times University of the Year in 2006 after winning the inaugural Times Higher Education Supplement University of the Year prize in 2005. Fallowfield Campus is the main residential campus in Fallowfield, approximately 2 miles (3 km) south of the main site. In 1883, a department of pharmacy was established at the university and, in 1904, Manchester became the first British university to offer an honours degree in the subject. The School of Pharmacy benefits from links with Manchester Royal Infirmary and Wythenshawe and Hope hospitals providing its undergraduate students with hospital experience. The Grade I listed Lovell Telescope at Jodrell Bank Observatory. 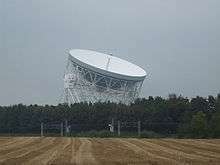 The Jodrell Bank Centre for Astrophysics comprises the university's astronomical academic staff in Manchester and Jodrell Bank Observatory on rural land near Goostrey, about ten miles (16 km) west of Macclesfield away from the lights of Greater Manchester. The observatory's Lovell Telescope, named after Sir Bernard Lovell, a professor at the Victoria University of Manchester who first proposed the telescope. Constructed in the 1950s, it is the third largest fully movable radio telescope in the world. It has played an important role in the research of quasars, pulsars and gravitational lenses, and in confirming Einstein's theory of General Relativity. A £1.2 billion Square Kilometre Array with 50 times more sensitivity and the ability to search space 10,000 times faster than any other telescope in existence will become operational in 2020. The Faculty of Humanities includes the School of Arts, Histories and Cultures (incorporating Archaeology; Art History & Visual Studies; Classics and Ancient History; Drama; English and American Studies; History; Museology; Music; and Religions and Theology) and the Schools of Combined Studies; Education; Environment and Development; Architecture; Languages, Linguistics and Cultures; Law; Social Sciences and the Manchester Business School. The Faculty of Humanities also jointly administers the Manchester School of Architecture (MSA) in conjunction with Manchester Metropolitan University and MSA students are classified as students of both universities. The University of Manchester is a major centre for research and a member of the Russell Group of leading British research universities. In the first national assessment of higher education research since the university's founding, the 2008 Research Assessment Exercise, the university was ranked third in terms of research power (after Cambridge and Oxford) and sixth for grade point average quality among multi-faculty institutions (eighth when including specialist institutions) Manchester has the fifth largest research income of any British university (after Oxford, Imperial, UCL and Cambridge). (these five universities have been informally referred to as the "golden diamond" of research-intensive UK institutions). Manchester has a strong record in terms of securing funding from the three main UK research councils, EPSRC, MRC and BBSRC, being ranked fifth, seventh and first respectively. In addition, the university is one of the richest in the UK in terms of income and interest from endowments: a recent estimate placed it third, surpassed only by Oxford and Cambridge. Despite recent severe cuts in higher education Manchester remains at second place behind Oxford nationally in terms of total recurrent grants allocated by the HEFCE. According to The Sunday Times, "Manchester has a formidable reputation spanning most disciplines, but most notably in the life sciences, engineering, humanities, economics, sociology and the social sciences". As of 2016, Manchester is ranked as the 8th, 10th and 49th most reputable university in the UK, Europe and the world respectively. Manchester was also given a prestigious award for Excellence and Innovation in the Arts by the Times Higher Education Awards 2010. In an employability ranking published by Emerging, where CEOs and chairmen were asked to select the top universities which they recruited from, Manchester placed 24th in the world and 5th nationally, ahead of academic powerhouses such as Cornell, UPenn and LSE. The QS World University Rankings 2016-17 placed Manchester 29th in the world. The Academic Ranking of World Universities 2016 ranked Manchester 5th in the UK and 35th in the world. The Manchester Business School is currently ranked 29th worldwide (4th nationally) by the Financial Times. However, while world rankings (such as QS, ARWU, THE) typically place the university within the top 10 in the UK, in national studies the university ranks less favourably. The Times/Sunday Times 'Good University Guide 2015' ranked Manchester 28th out of universities in the UK, 'The Complete University Guide 2016' placed it at 28th, whilst 'The Guardian University Guide 2016' ranked Manchester at 29th in the UK. This apparent paradox is mainly a reflection of the different ranking methodologies employed by each listing: global rankings focus on research and international reputation, whereas national rankings are largely based on entry standards, graduate prospects and student satisfaction with teaching at the university. Unlike many other students' unions in the UK, it does not have a president, but is run by an 8-member executive team who share joint responsibility. The University's Boat Club is one of many Athletic Union Clubs that Manchester offers. In the eight years up to 2013 Manchester have won the BBC2 quiz programme University Challenge four times, drawing equal with Magdalen College, Oxford, for the highest number of series wins. Since merging as the University of Manchester, the university has consistently reached the latter stages of the competition, progressing to at least the semi-finals every year since 2005. Many notable people have worked or studied at one or both of the two former institutions that now form the University of Manchester, including 25 Nobel prize laureates. Some of the best-known are: John Dalton (founder of modern atomic theory), Ludwig Wittgenstein (considered one of the most significant philosophers of the 20th century, who studied for a doctorate in engineering), George E. Davis (founder of the discipline of Chemical Engineering), Marie Stopes (pioneer of birth control and campaigner for women's rights), Bernard Lovell (a pioneer of radio astronomy), Alan Turing (one of the founders of computer science and artificial intelligence), Tom Kilburn and Frederic Calland Williams (who developed Small-Scale Experimental Machine (SSEM) or "Baby", the world's first stored-program computer at Victoria University of Manchester in 1948), Irene Khan (former Secretary General of Amnesty International), physicist and television presenter Brian Cox, the author Anthony Burgess and Robert Bolt (two times Academy Award winner and three times Golden Globe winner for writing the screenplay for Lawrence of Arabia and Doctor Zhivago). A number of politicians are associated with the university, including the current presidents of the Republic of Ireland and the Somaliland region of Somalia and prime ministers of Palestine and Iraq, as well as several ministers in the United Kingdom, Malaysia, Canada and Singapore. The vice president of Tanzania (November 2015 – present), Samia Hassan Suluhu, also attended the University of Manchester. Chaim Weizmann, a senior lecturer at the university, was also the first President of Israel. The university educated a number of the leading figures of Alternative Comedy: Ben Elton, Ade Edmonson and Rick Mayall. Additionally, a number of well-known actors have studied at the university, including Benedict Cumberbatch, who most notably portrays Sherlock Holmes in the TV series Sherlock, as well as playing the role of Manchester's own Alan Turing in the 2014 Oscar-winning biopic The Imitation Game. The University of Manchester, inclusive of its predecessor institutions, numbers 25 Nobel Prize recipients amongst its current and former staff and students, with some of the most important discoveries of the modern age having been made in Manchester. Manchester University has the third largest number of Nobel laureates in the UK, only Cambridge and Oxford universities having a greater number. 1 2 3 4 5 6 "Financial statements for the year ended 31 July 2015". University of Manchester. Retrieved 10 December 2015. 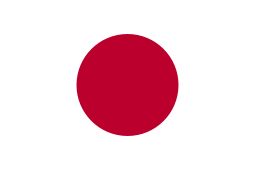 ↑ Encyclopaedia Britannica (15th edn) vol.7 p.760 and vol.23, p.462. 1 2 "Academic Ranking of World Universities 2016". Shanghai Ranking Consultancy. Retrieved 15 August 2016. ↑ "Global Employability University Ranking 2013". Times Higher Education. Retrieved 31 May 2015. ↑ "EPSRC Press Release". Retrieved 3 February 2012. ↑ Manchester New Technology Institute. "Locations—One Central Park". Retrieved 5 July 2010. ↑ "School of Medicine". University of Manchester. Retrieved 3 April 2008. ↑ Waugh, Rob (6 December 2011). "IBM braces itself for 'deluge' of data from telescope which outputs an 'exabyte' of data a day – more traffic than the whole internet". Daily Mail. London. Retrieved 1 April 2013. ↑ "Leading economist joins Manchester Business School". Manchester Business School. Retrieved 11 December 2007. ↑ "RAE 2008: results for UK universities |". The Guardian. London. 18 December 2008. Retrieved 20 March 2010. ↑ "RAE 2008: The results". Times Higher Education. Retrieved 8 January 2009. ↑ "Hefce university funding tables for 2009–10 |". The Guardian. London. 5 March 2009. Retrieved 20 March 2010. ↑ "ACTUAL ARTICLE TITLE BELONGS HERE!". The Guardian. London. 5 August 2008. Retrieved 26 December 2010. ↑ "Total funding for Higher Education Institutions 2010–11" (PDF). Times Higher Education. 17 March 2011. Retrieved 16 August 2013. 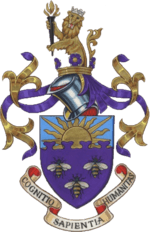 ↑ The History of The Manchester Museum, University of Manchester. Retrieved 25 November 2007. 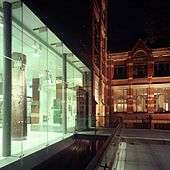 ↑ "A Short History of The Whitworth Art Gallery". Retrieved 10 March 2008. ↑ "Global Employability University Ranking 2015 'Emerging' League Table". Retrieved 18 May 2016. ↑ "Business school rankings from the Financial Times – Manchester Business School". Financial Times. Retrieved 16 August 2013. ↑ "Accommodation available at Whitworth Park Halls".